Bill was a very successful cross-country runner during his time at Aberdeen University, competing in around 64 League, University and Championship races winning 50% of these. In the 1961 Scottish National Junior Cross-Country Championship Bill Ewing (Aberdeen University Hares & Hounds) finished 16th. That summer, representing Aberdeen University AC he was third in the East District Junior One Mile event. Bill improved to thirteenth in the 1962 Scottish National Junior and was named as reserve for the Scottish team for the International Junior Cross-Country. In 1963 he was second to his close AU rival Mel Edwards in two cross-country races – against Durham University and in Belfast against Queens University. Then he finished a good fourth (behind winner Mel) in the annual Scottish Universities versus the SCCU fixture. In 1964 Bill became a senior athlete and came fifteenth in the Scottish National. In the East of Scotland track championship, Aberdeen completed a clean sweep in the Three Miles with Mel Edwards first, Alastair Wood second and Bill Ewing third. Aberdeen University was invited to take part in the Edinburgh to Glasgow relay that November and won the ‘most meritorious’ medals finishing eleventh with Bill taking them from ninth to fifth on the second stage. 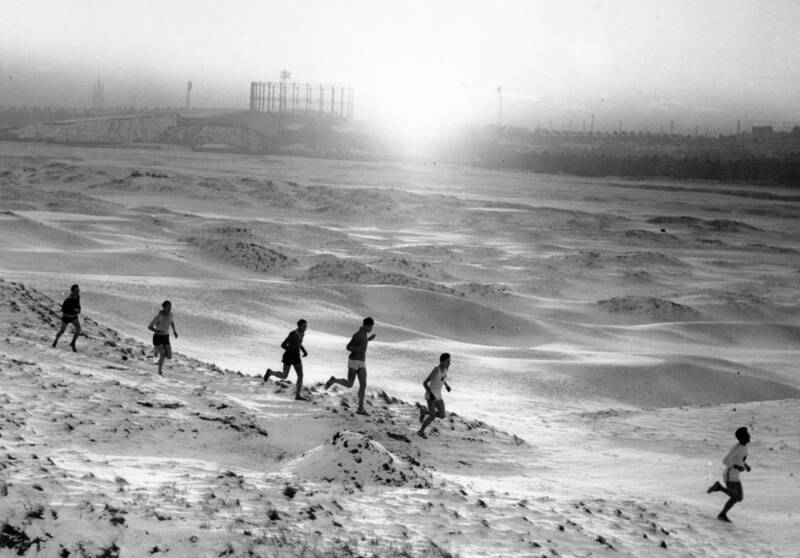 In the 1964-65 North-East Cross-Country League, over a number of testing courses, including Aberdeen University’s (which featured cobbles, road, dangerous steps, a shaking bridge, steep grass, sand dunes and an inevitably soggy stretch of beach), Bill led his team to victory and secured individual wins in all four fixtures, including a fine new record of 33:27 set on his home trail. Then in the 1965 Scottish National, Bill Ewing finished an excellent seventh, just in front of Alastair Wood and Steve Taylor. His reward was selection for the Scottish team to compete in the forthcoming International Cross-Country Championships in Ostend, Belgium where he finished 92nd from 125 athletes. Aberdeen University Hare & Hounds were fourteenth in the 1965 Edinburgh to Glasgow with Bill tackling the long sixth stage. 1966 was another successful year for Bill Ewing. He won the East District Cross-Country Championship, as well as retaining his individual NE League title. Then he was seventh in the National but was squeezed out of the Scottish team for the international CC by only ten seconds. However his summer focus had become the 3000m steeplechase and in the SAAA Championships Bill won a bronze medal behind the outstanding John Linaker and Lachie Stewart, who both competed in the Commonwealth Games in Kingston, Jamaica later that year. Bill was selected for the Scottish team to take on Iceland in Reykjavik where he secured a rare double, winning both the steeplechase and the 5000m. In the 1966 E-G, he ran for Aberdeen AAC and they only just failed to win bronze with Bill tackling stage four. One of Bill Ewing’s finest races was when he won the Scottish AAA 3000m steeplechase title in 8:55.2 on Saturday 24th June on the new black all-weather track. This was the first National track championships that I had attended and on a hot day, after narrowly avoiding being lapped by Lachie Stewart in the three miles, I settled to spectating. Alastair Wood won the marathon by some distance from Donald Ritchie but the event which really held me rapt was Bill’s one. From start to finish it was a battle with Edinburgh University’s rising star Gareth Bryan-Jones. I think that Gareth was leading before Bill sprinted into the lead on the last lap. Into the back straight and Gareth started to catch up. Suddenly, just before the final bend Bill, who was still actually in front, suddenly stopped and I nearly had a heart attack! Then I realised that the finish, uniquely, was there rather than in front of the grandstand – and Bill had won a gold medal! For the second time in succession, the E to G proved dramatic for Aberdeen AAC. In 1967 Bill set them off in fine style with second place on the first stage before Mel Edwards moved them into the lead with the fastest time on stage two. When the final leg commenced, AAAC were in third position. Steve Taylor (who was fastest on stage four) wrote: “Terry Baker on his way to setting a new stage record, had pulled back a 70 yard deficit on the Shettleston runner, Henry Summerhill, and as Terry moved ahead towards the finishing line, he was impeded by a taxi which suddenly pulled into his path (some say bearing the colours of Shettleston!) The judges decided (probably a harsh decision from an Aberdeen perspective) on a dead heat for second place. The strength of the Aberdeen team was reflected in the selection of three of their team – Bill Ewing, Steve Taylor and Alastair Wood – to represent the SCCU in their annual fixture against the Scottish Universities. Had Mel Edwards been available their representation would have been even greater. 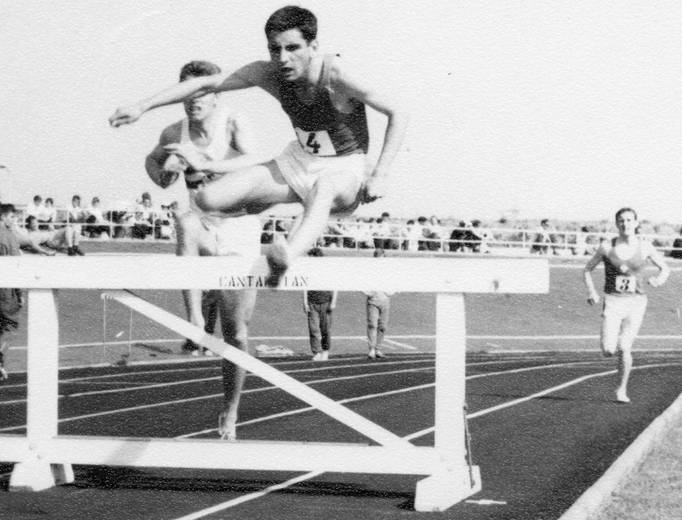 In the 1968 East District Track and Field Championships, Bill Ewing narrowly lost his 3000m steeplechase title to the outstanding Gareth Bryan-Jones who went on to win the AAA title and qualify for the British team for the British team in the Mexico Olympics. However Gareth was Anglo-Welsh (although he settled in Scotland and later became a Scottish International on track and country). Therefore Bill Ewing’s excellent time of 8:47.8 broke Lachie Stewart’s Scottish Native record. Subsequently Bill ran for the Scottish team in the British Isles Cup at Grangemouth. There he pushed 1964 Olympic silver medallist Maurice Herriott all the way to finish runner-up. Then at the SAAA Championships Bill was second again to Gareth, and was selected for the Scottish team versus Midland Counties fixture at Leicester where he came second to Maurice Herriott in a repeat of his personal best of 8:47.8. 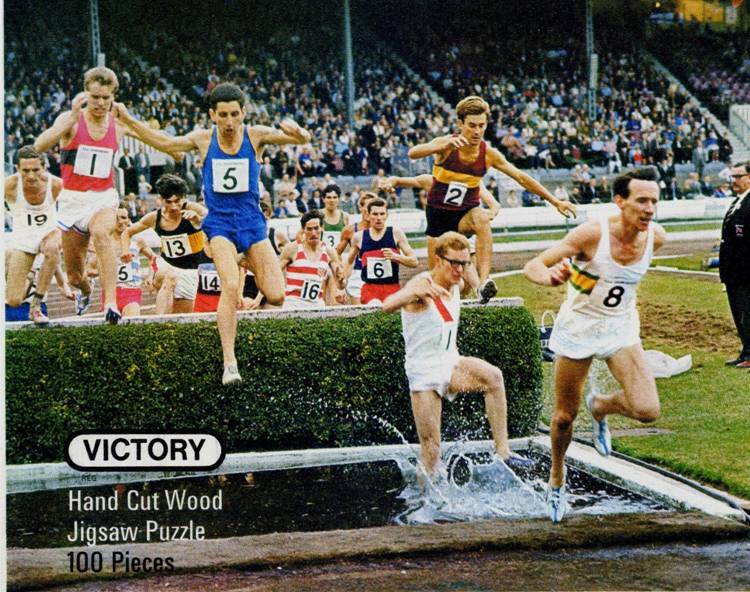 1968 was also the year when Bill won an Indoor 2000m steeplechase (no water jump!) at Cosford; a 3000m race at Varnamo, Sweden; and represented GB at a small meeting in Dunkirk, France where he won the 3000m steeplechase. In road racing, Bill held the records for the Pitreavie AAC Dunfermline Glen course and the Perth Strathtay Harriers Two Inches course (two laps). The 1968 edition of the Edinburgh to Glasgow saw AAAC finishing second to Shettleston Harriers with Bill Ewing breaking the record on the eighth and final stage. After that Bill Ewing began to suffer injury problems, particularly with his Achilles tendons. Although he ran 14:30.8 for 5000m, he could only manage 9:01.6 for fourth place in the 1969 SAAA championships (and in the steeplechase rankings behind Bill Mullett, Gareth Bryan-Jones and Alistair Blamire). However in 1970 when the Commonwealth Games were in Edinburgh, Bill was unlucky not to be selected – the SAAA would not have to pay much in the way of travel expenses, would they? In the East District Championships, he was second to Dave Logue who was selected to run in the Games for Northern Ireland. The SAAA event produced a bronze medal for Bill Ewing behind Gareth Bryan-Jones and Bill Mullett, yet only Bryan-Jones was chosen as Scotland’s sole Commonwealth Games steeplechaser. Bill Ewing finished second in the Scottish rankings with 8:55.4 when he finished in front of Bill Mullett a week after the SAAA race and just five weeks before the Games. Although Bill Ewing continued to take part in races for several years, he retired from track competition. Yet he had made his mark on Scottish Athletics and should be remembered as an elegant runner who showed considerable toughness and speed on track, road and country.